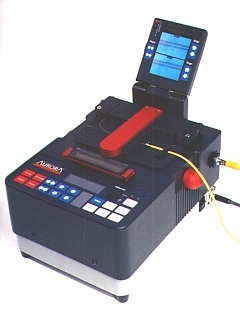 Aurora Optics introduces Fusion Splicing with two simultaneous views of the fibers on a stylish video monitor, together with the lowest available losses and most accurate splice loss estimates. In just 35 seconds, you will have automatically aligned, gapped and fused two single mode fibers with our advanced microprocessor-controlled system. As new fibers are introduced, you can easily accommodate the changes. The Fusion 2500 will store 20 fiber splicing profiles and hold the results of 100 splices for later downloading through the RS232 port. Couple that with our pigtail port system, built-in heater and video output monitor for display on any external NTSC monitor. Formed aluminum, "o"-ring sealed. Dust and watertight when cover is closed and latched. Shock resistant.